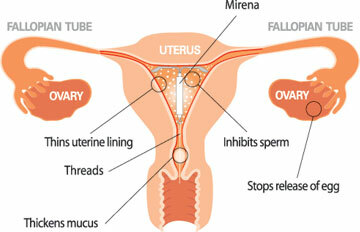 Mirena is the brand name of an intrauterine contraception device (IUD). This IUD uses progesterone instead of copper and will reduce or completely eliminate menstruation. Mirena is a reliable birth control method for women who don’t plan on getting pregnant for several years and prefer not to have to remember to take a birth control pill at the same time daily. It is also a common treatment for those women which suffer from menorrhagia, very heavy periods. Generally speaking, pregnancy after Mirena removal is not a problem, however, certain precautions should be taken. Is It Possible for Pregnancy After Mirena Removal? The Mirena IUD is a contraceptive that relies on releasing hormones. It is placed within the uterus and will directly deliver a small quantity of the hormone progestin to the uterus. As a contraceptive method, Mirena will need to be placed by your doctor or healthcare provider and can be effective for five years. The placement of the IUD will occur within seven days after the start of your menstrual period and has an effectiveness of 99%. If you have a Mirena IUD and decide you want to get pregnant, your doctor can remove the IUD for you. Although the contraceptive effects of the device should disappear immediately, most health care professionals recommend waiting one menstrual cycle or more before you try to conceive as this will allow your body to return to its former natural rhythm. About 80% of women who attempt to conceive after having their Mirena IUD removed will successfully conceive within a year of the device’s removal. Many women have said they waited between six months and a year between having their Mirena IUD removed and their menstrual cycle returning to normal. Others have said that they had to wait more than a year or two before they regained their fertility. If you have been waiting more than 18 months or are desperate to get pregnant, you should consider talking to a fertility doctor as other factors may be preventing conception. After your Mirena is removed, it is common for the body to go through a readjustment period in which it gets used to the new hormonal balance. During this period you may experience symptoms similar to those associated with pregnancy such as spotting, irregular periods, mood swings, sore breasts, nausea, bloating, or pain. Always consider the possible side effects before using Mirena. In some cases this type of contraception will cause PID (pelvic inflammatory disease) and this will usually occur as a result of the insertion process and symptoms will develop within twenty days after insertion, although sometimes it will develop later. PID may damage the fallopian tubes and later on this may lead to infertility or ectopic pregnancy. In severe cases it could lead to complete infertility or even death. Less than ten percent of women who use Mirena will have negative effects and most of these will include pain, irregular spotting or bleeding unrelated to periods, missed periods, uterine or vaginal bleeding, or ovarian cysts. Only about 1% of Mirena users develop ovarian cysts. Mirena can be used to prevent intrauterine conception for 5 years. It can also help treat heavy menstrual bleeding and can be used by women who have previously had a child. Patients with certain types of congenital or valvular heart disease or systemic-pulmonary shunts which are surgically constructed should be careful as Mirena can increase the risk of an infective endocarditis or be a source for septic emboli. Patients with these problems should be given the correct antibiotics during the insertion and removal procedure. It is also important to monitor for infections in the case of patients taking insulin because of diabetes or doing chronic corticosteroid therapy. What If You Get Pregnant While with Mirena? If you become pregnant, the Mirena should be removed. Manipulating or removing it may lead to a miscarriage, but half of the pregnancies that occur while using Mirena are ectopic. There is an increased risk of ectopic pregnancy for those with a history of pelvic infection, tubal surgery, or ectopic pregnancy.